In the Emperor’s Name! | In Her Majesty's Name! 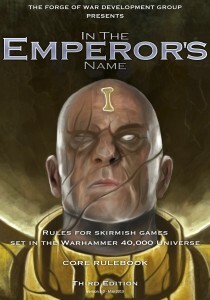 In The Emperor’s Name (also known as ITEN) is a set of rules for skirmish games set in the Warhammer 40,000 universe created by Games Workshop. ITEN allows you to create narrative games inspired by the adventures of characters such as Gregor Eisenhorn, Gideon Ravenor or Shira Calpurnia, or any of the millions of Inquistors, Arbitrators, Roque Traders, Explorators and other personalities of the Imperium — as well as their enemies, be they Xenos or Chaos. In The Emperor’s Name was originally created by Craig Cartmell and the other members of the Forge Of War Development Group. The latest edition was edited and revised by Gavin Brown. What few people know is that without ItEN, IHMN would not exist. Phil, an editor at Osprey Publishing, so liked ItEN that he gave us the opportunity to create IHMN. This entry was posted in The Announcements Column by Craig. Bookmark the permalink.